A broken collar bone (also called fractured clavicle) is a very common injury that happens in people of all ages. It is also one of the most common sports injuries that happens to children and teenagers. Your collar bones (clavicle) are the long bones running from the centre of your chest to your shoulders, underneath your neck and above your ribs. They run from your breastbone (sternum) to the top part of your shoulder blade (scapula), and connect your arms to your body. 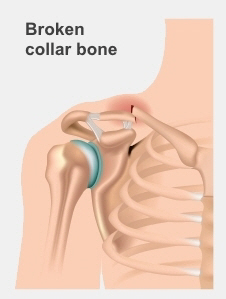 People usually break a collarbone if they have been hit directly on their shoulder or fallen onto an outstretched arm. 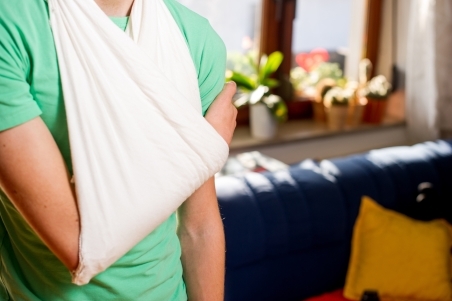 Collar bone breaks are common in contact sports (like football, rugby and hockey) and in sports where there is a chance of a hard fall (such as biking, skiing, snowboarding, and skateboarding). A collar bone can also break when it is directly hit during a car collision or other accident. When children break a collar bone it generally happens in the middle of the bone, with the broken ends still together. These breaks usually heal well simply with rest and time. Occasionally, however, if the broken ends of the collar bone are pointing away from each other, or the break is severe, the child may need surgery to realign the bone. If this happens, the surgeon will use screws and plates, or occasionally wires (called titanium elastic nails), to hold the pieces of the collar bone in place as they heal. The surgeon will discuss details of your child's particular surgery with you. There are some things you and your child can do to make sure the bone heals as well and as quickly as possible. Your child should wear a sling for two to three weeks so they are as comfortable as possible. In the first 24 to 48 hours, get your child to hold an ice pack against their shoulder (or do it for them), for 20 minutes at a time. This will decrease pain and swelling. Your child may need simple pain medication. Give it to them regularly until they are comfortable, but never exceed the recommended dose. At first it may be difficult to sleep. Sleeping in a recliner chair or propped up with pillows may help. Encourage your child to move their elbow, hand, and fingers. Once they stop wearing a sling they can also start moving their shoulder gently. Your child may return to sports such as swimming as soon as they are comfortable. However, they should avoid contact sports for six weeks after they stop using a sling. Your doctor or nurse practitioner will tell you when they will need to see your child again. Sometimes for straightforward breaks that are still in a normal position, your child may not need any follow up. pain at the site of the break after six weeks. This factsheet has some more information about what happens when a child's collar bone is healing. KidsHealth – Broken collarbone (clavicle fracture), retrieved January 2017. Victorian Paediatric Orthopaedic Network – Fracture of the clavicle (collar bone), retrieved January 2017.